"Listen to me: everything you think you know, every relationship you’ve ever taken for granted, every plan or possibility you’ve ever hatched, every conceit or endeavor you’ve ever concocted, can be stripped from you in an instant. Sooner or later, it will happen. So prepare yourself. Be ready not to be ready. Be ready to be brought to your knees and beaten to dust. Because no stable foundation, no act of will, no force of cautious habit will save you from this fact: nothing is indestructible." 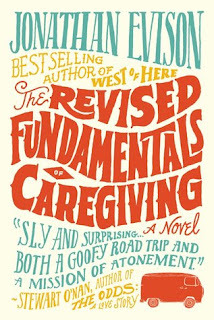 I've just spent the last three days immersed in the wonderful new novel The Revised Fundamentals of Caregiving by Jonathan Evison. It's the story of one man's journey through grief, but ultimately it's a story of hope and redemption. 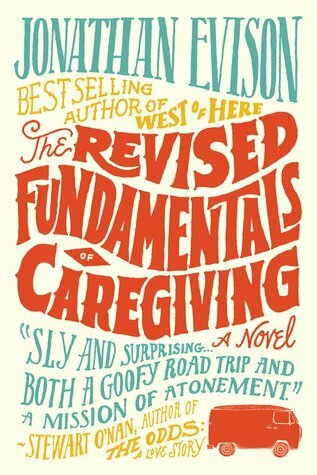 The Revised Fundamentals of Caregiving is Evison's third novel, and as I understand it, his most personal. He happens to live in my community and I went to his reading last week at Eagle Harbor Books. As always, he was funny, quick-witted and a true pleasure to listen to. I knew this novel was garnering some good reviews and because I so enjoyed his first book All About Lulu, I was looking forward to reading it. (For some reason I have not read his second book-West of Here-but it's on my list now). Anyway, what I wasn't prepared for at the reading was when he told us that this is a book that he's been carrying around with him since his 16-year-old sister died in an automobile crash years ago. He spoke about the grief that tore into his family, and I, of course, leaned in even more. And while the story is not about his sister, it is about what that most unimaginable of losses--the loss of a child--does to a family. The book opens with Benjamin Benjamin ruminating on his life, which we quickly learn has hit rock bottom. He's lost his wife, house and livelihood, and alludes to a horrible tragedy 18-months ago, which we soon learn is the loss of his children. "My life, if it could be called one, bled mindlessly through the hours like ink on a blotter" (p. 16). Bogged down for the past 18 months in what he terms the "blur," Benjamin decides to take a night class called "The Fundamentals of Caregiving" as a way to re-enter the workforce. His first assignment is nineteen-year-old Trevor, an angry teenager with the debilitating disease of Duchenne Muscular Dystrophy. Benjamin tells his story, alternating between the past and the present, and along the way we meet some of the funniest, quirkiest characters in modern literature. A lot goes on in this 276-page book, and I found myself fluctuating between laughing and crying as Benjamin's story unfolds. The dialogue is snappy, irreverent and immensely readable. The first third of the book is a little slower-paced, as we come to know Ben (past and present), and the people in his life (past and present). But then Ben and Trevor go on a road trip to visit Trev's long-estranged father Bob, and with that the pace picks up. More oddball characters are introduced, and as their journey continues both Ben and Trev begin to make peace with what life has dealt them. You'd think a novel that holds so much sadness would make one feel depressed and hopeless, but it doesn't. For ultimately, The Revised Fundamentals of Caregiving is a story about hope and Benjamin's struggle for salvation. It's about our remarkable ability to carry on even in the worst of circumstances. It's about love. It's also happens to be hilarious in parts. I admit that knowing Evison's personal story lent a certain poignancy to it. I can fully understand his need to tell his grief story. I get it. I don't write that many book recommendations, primarily because that's not the purpose of this blog. In fact, I've only posted two others: Hannah Coulter by Wendell Berry and The World to Come by Dara Horne. I realize that the lens through which I now view the world is that of a bereaved mom, and all three of these books offer something different to me now than they might have 22 months ago. But whatever lens through which you view the world, I think a read of The Revised Fundamentals of Caregiving is definitely worth it. You'll laugh and you'll cry; what more could you want from a book? Please consider buying The Revised Fundamentals of Caregiving at your local independent bookstore. Thank you for the recommendation. Since my lens is the same as yours (bereaved mum), I appreciate the suggestion. I've added it to my Amazon wish list. This was my favorite book of the year and this is a wonderful review/tribute for it. Thanks Robin. Thank you for this thoughtful recommendation; it sounds like a wonderful book. I have not been able to make it to any of the local author nights as I wished to this month - missed him AND Maria Semple. I'm thankful that we have such a strong, supportive community for writers - and thankful to you for sharing your insight about this book. P.S. - We got to hear him at Liberty Bay Books' event last night - he was just as good as you said he was! I quoted you on my new blog when I wrote about it. HUGs to you - looking forward to our walk next week!